The Print Settings tool serves for printer configuring, maintenance of printer configuration files, print spool directories and print filters, and printer classes management. The tool is based on the Common Unix Printing System (CUPS). If you upgraded the system from a previous Red Hat Enterprise Linux version that used CUPS, the upgrade process preserved the configured printers. The cupsd.conf man page documents configuration of a CUPS server. It includes directives for enabling SSL support. However, CUPS does not allow control of the protocol versions used. Due to the vulnerability described in Resolution for POODLE SSLv3.0 vulnerability (CVE-2014-3566) for components that do not allow SSLv3 to be disabled via configuration settings, Red Hat recommends that you do not rely on this for security. It is recommend that you use stunnel to provide a secure tunnel and disable SSLv3. For more information on using stunnel, see the Red Hat Enterprise Linux 7 Security Guide. For ad-hoc secure connections to a remote system's Print Settings tool, use X11 forwarding over SSH as described in Section 12.4.1, “X11 Forwarding”. 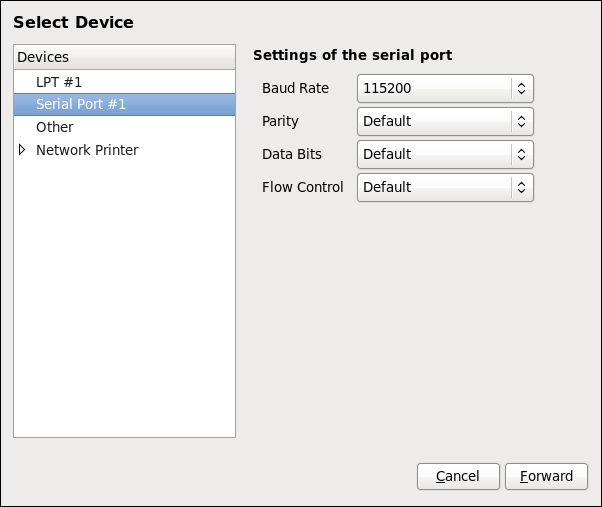 With the Print Settings configuration tool you can perform various operations on existing printers and set up new printers. You can also use CUPS directly (go to http://localhost:631/ to access the CUPS web application). To start the Print Settings tool from the command line, type system-config-printer at a shell prompt. The Print Settings tool appears. Alternatively, if using the GNOME desktop, press the Super key to enter the Activities Overview, type Print Settings and then press Enter. The Print Settings tool appears. The Super key appears in a variety of guises, depending on the keyboard and other hardware, but often as either the Windows or Command key, and typically to the left of the Spacebar. 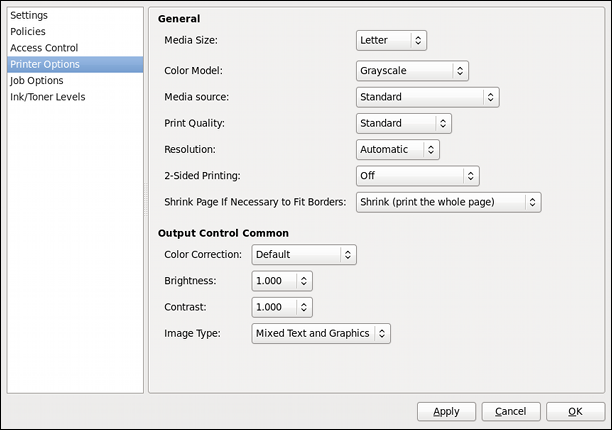 The Print Settings window depicted in Figure 16.1, “Print Settings window” appears. Start the Print Settings tool (refer to Section 16.3.1, “Starting the Print Settings Configuration Tool”). Go to Server → New → Printer. In the Authenticate dialog box, enter an administrator or root user password. If this is the first time you have configured a remote printer you will be prompted to authorize an adjustment to the firewall. Select the printer connection type and provide its details in the area on the right. 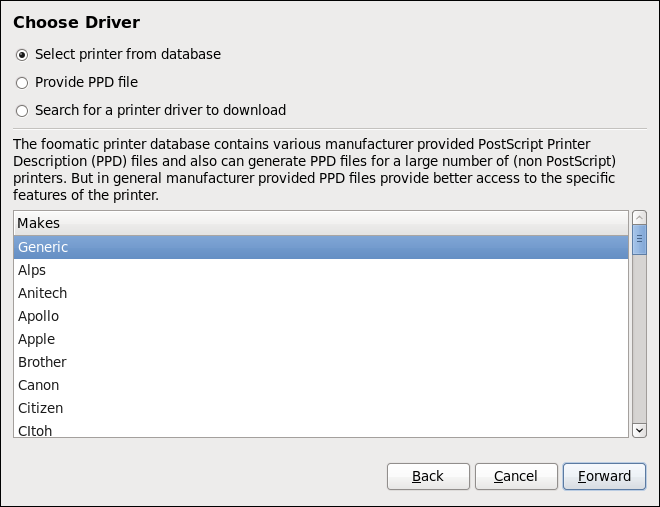 Open the Add printer dialog (refer to Section 16.3.2, “Starting Printer Setup”). Select the printer model. See Section 16.3.8, “Selecting the Printer Model and Finishing” for details. 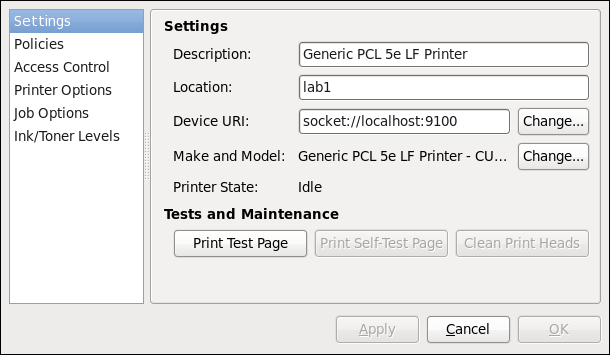 Open the New Printer dialog (refer to Section 16.3.1, “Starting the Print Settings Configuration Tool”). 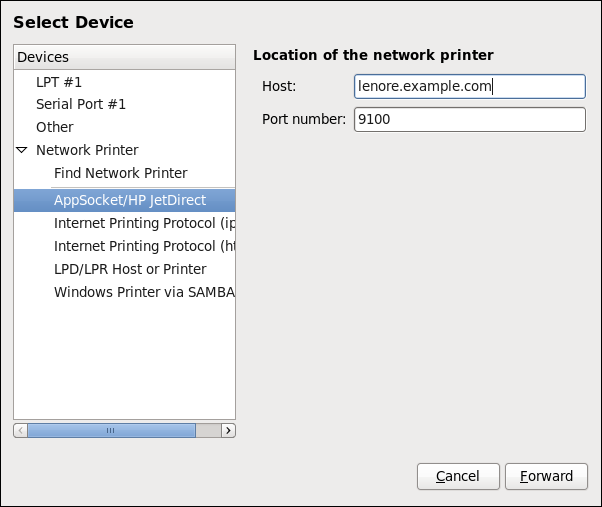 In the list on the left, select Network Printer → AppSocket/HP JetDirect. 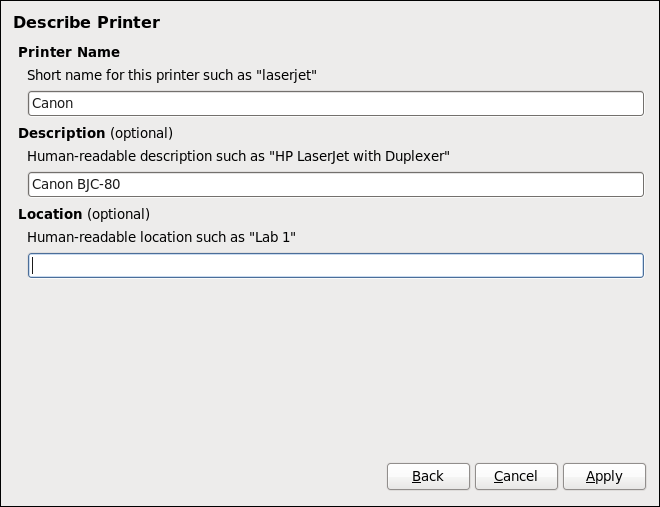 Open the New Printer dialog (refer to Section 16.3.2, “Starting Printer Setup”). 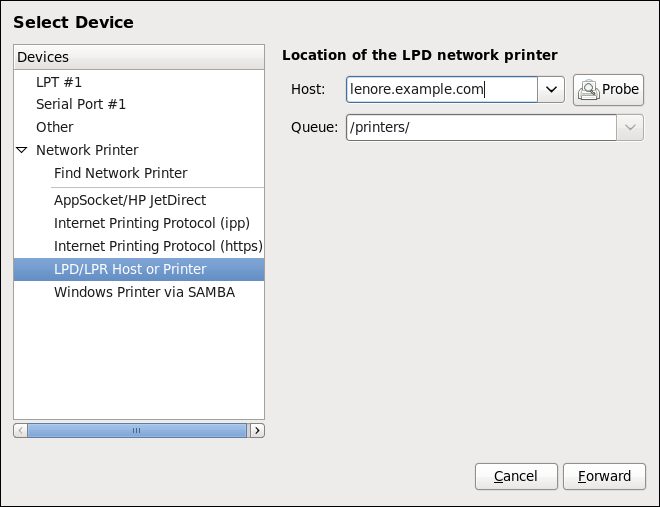 In the list of devices on the left, select Network Printer → LPD/LPR Host or Printer. For more information on installing packages with Yum, refer to Section 9.2.4, “Installing Packages”. 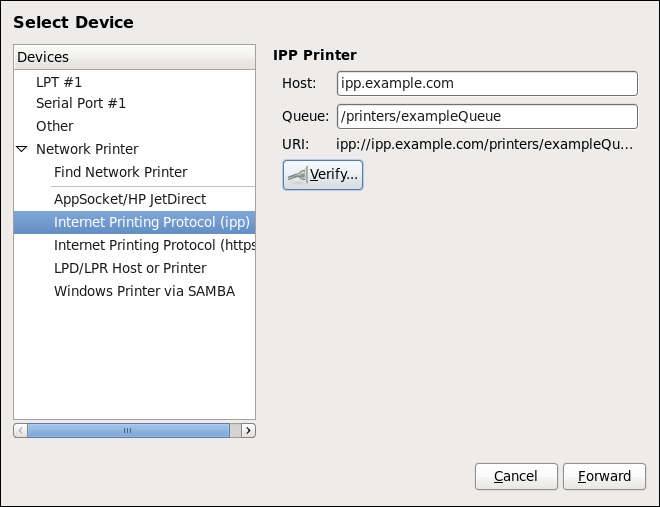 In the list on the left, select Network Printer → Windows Printer via SAMBA. Enter the SMB address in the smb:// field. Use the format computer name/printer share. In Figure 16.6, “Adding a SMB printer”, the computer name is dellbox and the printer share is r2. Therefore, when you choose a user name and password to access a Samba printer, it is advisable that you choose a password that is different from what you use to access your local Red Hat Enterprise Linux system. 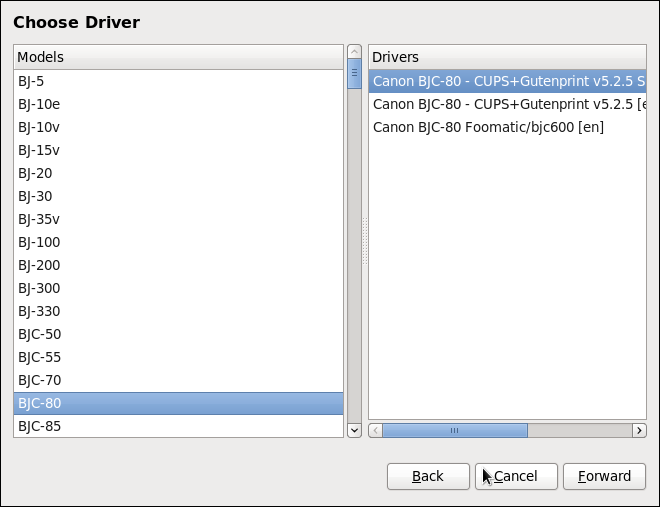 Select a Printer from database — the system chooses a driver based on the selected make of your printer from the list of Makes. If your printer model is not listed, choose Generic. 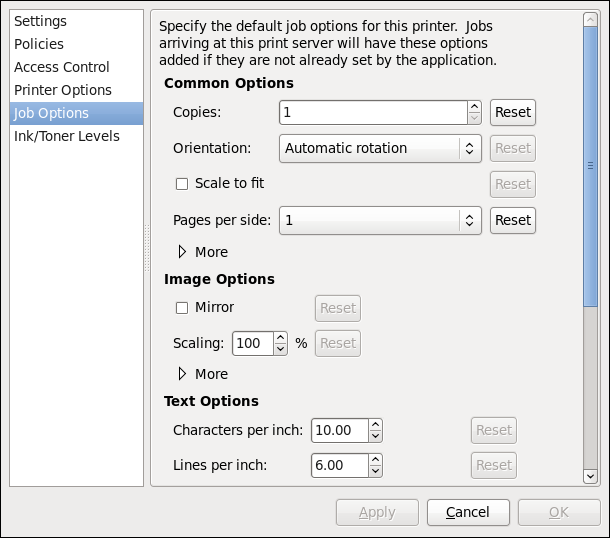 If applicable for your option, window shown in Figure 16.8, “Selecting a printer model” appears. Choose the corresponding model in the Models column on the left. After the changes are applied, a dialog box appears allowing you to print a test page. Click Yes to print a test page now. Alternatively, you can print a test page later as described in Section 16.3.9, “Printing a Test Page”. To delete an existing printer, in the Print Settings window, select the printer and go to Printer → Delete. Confirm the printer deletion. Alternatively, press the Delete key. On the Policies page, you can mark a printer as shared: if a printer is shared, users published on the network can use it. To allow the sharing function for printers, go to Server → Settings and select Publish shared printers connected to this system. Look for the word “Connected” in the lower left corner. This indicates that the firewall-config tool is connected to the user space daemon, firewalld. 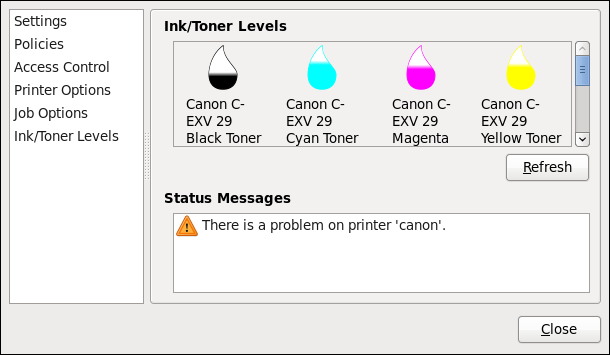 During the printing process, the Printer Status icon appears in the Notification Area on the panel. 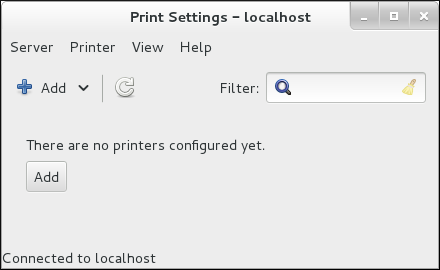 To check the status of a print job, click the Printer Status, which displays a window similar to Figure 16.16, “GNOME Print Status”. If you want to cancel a print job, find the job number of the request with the command lpstat -o and then use the command cancel job number. For example, cancel 60 would cancel the print job in Example 16.15, “Example of lpstat -o output”. 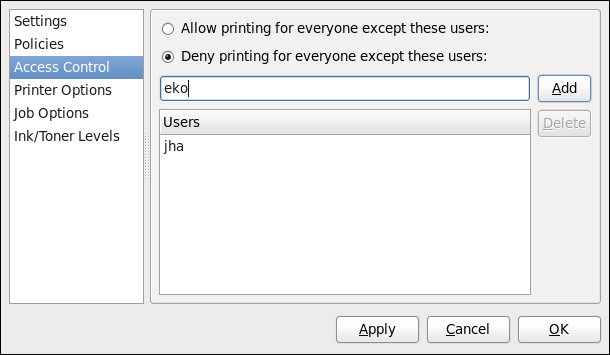 You cannot cancel print jobs that were started by other users with the cancel command. However, you can enforce deletion of such job by issuing the cancel -U root job_number command. To prevent such canceling, change the printer operation policy to Authenticated to force root authentication. lp(1) — The manual page for the lp command that allows you to print files from the command line. lpr(1) — The manual page for the lpr command that allows you to print files from the command line. cancel(1) — The manual page for the command-line utility to remove print jobs from the print queue. mpage(1) — The manual page for the command-line utility to print multiple pages on one sheet of paper. cupsd(8) — The manual page for the CUPS printer daemon. cupsd.conf(5) — The manual page for the CUPS printer daemon configuration file. classes.conf(5) — The manual page for the class configuration file for CUPS. lpstat(1) — The manual page for the lpstat command, which displays status information about classes, jobs, and printers. http://www.linuxprinting.org/ — The OpenPrinting group on the Linux Foundation website contains a large amount of information about printing in Linux. http://www.cups.org/ — The CUPS website provides documentation, FAQs, and newsgroups about CUPS.